Had an eye popping experience this weekend while discussing Recommended Dietary Allowances (RDA) for various vitamins and minerals and how or why certain ones became extremely important and others not. Which led me to a talk on Calcium. Which led me to exploring the RDA. Ever looked on your food label to see the nutrient breakdown? Hear something about how much Vitamin X, like Vitamin C or mineral Y, like calcium might make you better, faster, stronger, smarter, etc.? Then you start looking for it in foods on that ever helpful label, right? I recently learned how those RDAs are calculated and holy bleep, I’m not happy about it – doubt you will be either. Let me abbreviate: highest levels of calcium consumption are indeed highly correlated with Osteoporosis . . . as positive indicator. So highest levels of Calcium consumption match up with highest levels of fractures. Right. Wait. What?! This is the opposite of what I’ve heard for decades. I’m guessing for you too. If you’ve done some digging on this and have different info, please share. But that rather painfully direct stab at “known” knowledge was enough to get me to check on how the RDA does actually calculate things. It’s not based on what a human body needs. It’s based on a target that is 2 standard deviations above what the 50th percentile person consumes. For those less inclined to discuss bell curves and normal distributions, that means what the 97.5th percentile “person” consumes. The MASSIVE assumption is that what that 97.5th percentile person consumes is relevant to the population as a whole. And secondarily that more of Vit X or Mineral Y is better. So what the 97.5th percentile person consumes is best for everybody. Every body? So many things wrong with this I weep. Join me. Check out this beautiful illustration done by another smarty. The “average” person drinks 9.8 drinks per week. The standard deviation among the deciles (not ideal, but reasonable) is 23 drinks per week. 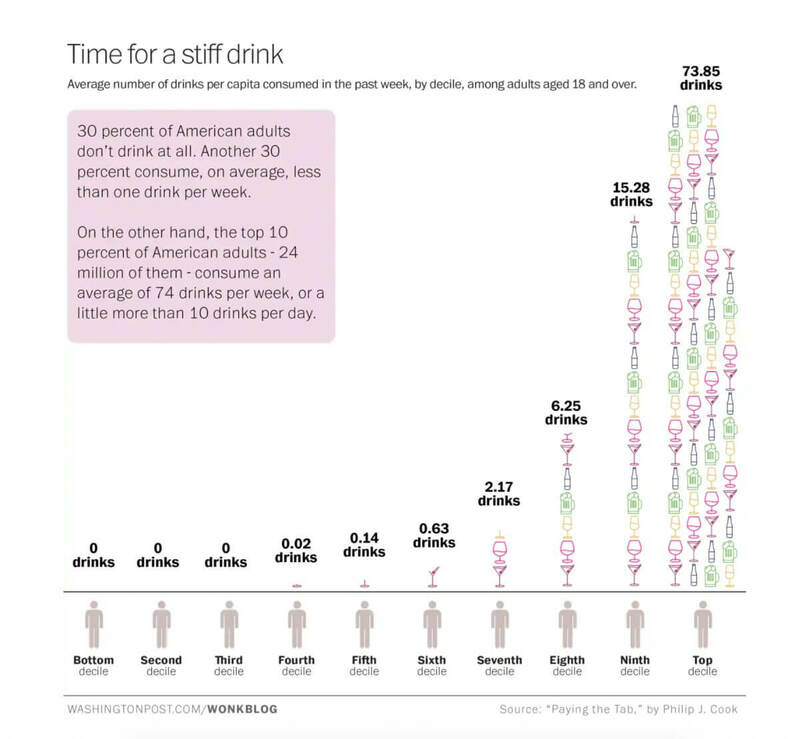 So imagine if you wanted to make sure your consumption was in line with 97.5th percentile (aka 2 std dev above the mean) of American Adults, you would need to drink 2 x 23 drinks per week on top of the 9.8 drinks per week average. Total: 55.8 drinks per week . . . or 8 per day. That is how the RDA would determine what is ideal drinking. So the RDA recommends 56 drinks per week? Even among my booziest of friends I don’t think anyone is on board for that every day, all year long. What you do on vacation . . . The Recommended Dietary Allowance (RDA), by definition, meets the requirements of 97.5 percent of the population. It is set from an Estimated Average Requirement (EAR) that represents an intake amount that will meet the needs of about 50 percent of the population. The RDA represents an intake amount that is 2 standard deviations above the EAR. National Academies of Sciences, Engineering and Medicine. So at first you may think, well 2 std dev above the amount that, “Meets the Needs,” of 50% of the population is concerned with meeting actual human needs – based on sound clinical research, right? Still this assumes that consuming more will be better – which is randomly applied after the magic 50th percentile amount is chosen. What exactly is wrong with meeting the needs at the 50% level? Do we know that the 50th percentile is not enough? So I still don’t like it, but the phrase meets the needs seems okay, right? Here’s where things get scary: they base the “meets the needs” criteria on what people are actually consuming. Over 30% of Americans consume no booze. Another 30% consume far less than one drink per week – so 60% consume effectively no booze. But the average is almost 10 drinks per person. Let’s cut some slack and try to be more reasonable (massage the data as it were). The 50th percentile person consumes zero drinks. So let’s call the meets-the-needs criteria for the 50th percentile zero drinks. We still have a two standard deviations above challenge. So to meet the needs at the 97.5% level, we all need to consume 46 drinks per week or just under 7 drinks per day. I think that sound is your liver crying. That says nothing of optimal. It says nothing of necessary. It is not based on what powers a body best, it is based on what a population already consumes. Based on analysis of nutrient metabolism in humans and data on intakes in the U.S. population, the committee recommends intakes for each age group–from the first days of life through childhood, sexual maturity, midlife, and the later years. Dietary Reference Intakes, The Health and Medicine Division (HMD), a division of the National Academies of Sciences, Engineering, and Medicine (the National Academies). Hopefully I’ve just misunderstood this research. It helps to see the “based on analysis of nutrient metabolism,” but when you dig into actual papers on Vit D, Calcium, Thiamine, etc. It looks like the skew is toward current intake levels not the magic of the body’s metabolic pathways. Here’s a starting point for your digging: RDA mentioned at National Academies of Science. We have been (diligently) following incredibly illogical advice. Why RDA is certainly wasting your money and might be making you sick.